Go ahead and give your answer and then see if you think I'm right after you read the rest of this post. I take no offense if you disagree with me. Here was my initial response to the problem. Jeff - I'm not a mathematician, but this seems pretty simple. If we have 3 answers (because of the repeat) and we randomly choose an option with the inbuilt assumption that one is correct then we have: a 100 percent chance of being right or wrong, a 66 percent chance of being wrong, and a 33 percent chance of being right. I just left it at that. I figured people would kind of put the rest together on their own. Rod responded to my comment and said this. 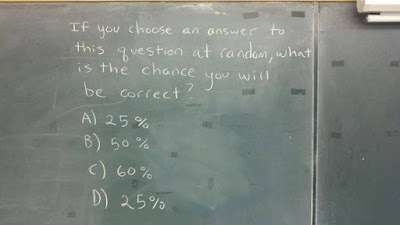 Rod - but at random, we'd choose (A)25% or (D)25% 50% of the time. If that's the right answer, then the odds are 50%...no? A lot of people said something similar, but I think they are making a mistake. If you choose an answer to this question at random, what is the chance that you'll be correct? If you choose an answer to a question that has four possible answers at random, what is the chance that you'll be correct? In that case we all know it is 25 percent. So we look at the answers knowing that there is something tricky about it or it wouldn't be a post... and we find it. There are two correct answers! That means we have a 50 percent chance. But that's not the actual question, it's what we are thinking the question is. If you choose an answer to a question that has three possible answers at random, what is the chance that you'll be correct? Because that's all of the possible answers there truly are. Now we know that they have not given a possible answer that satisfies the question. Thus, what we have is a false dichotomy (meaning neither answer is correct), but we could call it a false quadchotomy (meaning none of the four answers is correct).